The logistics of a move can - and will - influence your Aspergers (high functioning autistic) child's adjustment. For many "neurotypical" (i.e., non-autistic) kids, moving can be a positive experience, as it brings the opportunity to develop new friendships, pursue new interests, increase social confidence, and learn important lessons about adapting to change. However, as parents of Aspergers children know, “change” is extremely difficult for "Aspies." Transitions of any kind, especially those that are unpredictable, are unsettling and can cause the youngster to become totally undone. Knowing how to support your Aspie through change in order to make a successful transition is crucial. Helping with transitions is especially important during childhood “life event” changes (e.g., attending a new school, death in the family, divorce, going to college, moving, etc.). 1. Access religious and community organizations. They can provide a ready structure of activities, contacts, and resources for the whole family. If the family was involved with similar groups before, participating in such activities in the new location can increase feelings of familiarity. 2. Adolescents with Aspergers will be able to understand the nuances of the decision to move, but may be resistant to change. At a time when they are establishing important relationships outside of the family, they may feel the move threatens their evolving identity. The move can be disruptive to the stability they have already established with a core group of friends or with an athletic or academic path they are pursuing. 3. Allow your youngster to accompany you when viewing potential new homes. Encourage him to ask questions of the Realtor related to areas of interest or importance for him. This will help quell his anxieties, and you may be surprised to hear him ask questions you hadn't thought to ask yourself. 4. Be patient, some Aspergers kids will dive in, develop a support network of friends, and become involved with school and activities without missing a beat. Others may need more time and help to feel acclimated and at ease. Providing your Aspie with new experiences in new places will help him in the future when he makes decisions for himself about where to live. 5. 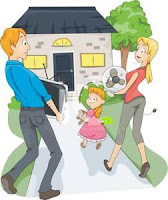 During a walk-through of a potential home, give your youngster the chance to speculate with you about room designations, potential location of furniture, changes in décor, etc. 6. For young Aspergers kids, put their furniture on the moving van last so that it is first to unload. This will help orient them quickly to the new surroundings. 7. Upon arrival to the new home, try to get the Aspergers youngster’s room in order before the rest of the house. 8. Have your Aspie pack a bag of essential, favorite, "can't live without" things to keep with them at all times. 9. If possible, have your Aspie invite a friend from his old neighborhood for a visit. This can help the youngster make decisions about what is new and fun, and also helps him get a much-needed dose of validation from an old friend. 10. If you are building a new home, it will be beneficial to you and your youngster to document the building process with your Aspie manning the camera. 11. It can be tempting to literally "clean house" and discard old toys and unused articles. But this should be done gingerly. The loss of material things will most likely overwhelm some Aspergers kids. Better to help them sort out the bulk of their things once they've moved in when they can feel more in control of their new environment. 12. Know that your Aspergers youngster may experience resistance, denial, and emotional upset when you break the news of the move to another house. Be wary of your youngster's potential to dip into a depressed state at this time as well. 13. Moving day will be very emotional for you all, but maintaining a positive attitude about a new beginning and a fresh start will be of great value. 14. Once the initial shock and heartbreak of the news subsides, share with your youngster thoughts about all the impending unknowns that face you and your family. 15. Once you've narrowed your choices of location to a select few, plan to document the final decision-making visits by taking photos or videos. Not only will this be an aid to your youngster, it will be as equally helpful to you as well in recalling certain details. 16. Partner with your youngster in as many facets of the moving process as possible. 17. Preschoolers with Aspergers are not able to understand the meaning of the move or complex explanations. They are affected more by the reactions and availability of their parents. Little children do best when things are predictable, so keeping to a routine with familiar things and people eases the transition for them. Avoid making other changes at the same time as the move (e.g., toilet training, transfer to a new bed, etc.) so as not to overwhelm and confuse a young Aspie. 18. Scheduling some trips away from the new home may actually help establish the new base. It becomes the place to "come home to" and enhances the sense of a familiar place. 19. School-age kids with Aspergers are likely to be concerned about fitting in with new friends and dealing with different academic demands. Their general personality and social style may influence their ease in adjustment. They may also be better able to tolerate the “new kid jitters” if a brother or sister will be at the same school. 20. Some Aspergers kids will actually thrive in the new environment depending on the circumstances of the move, an accepting peer group, and a supportive mentoring adult network. 21. Stay in contact with the school and other areas in which your Aspie is involved to monitor his progress in making the transition. Kids who are still sullen or angry at the parents about the move at home may have anger management issues at school as well. 22. The Internet and cell phone text messaging are a mixed blessing for kids who have recently moved. Contact with old friends helps a youngster stay connected to a support system and provides an outlet for talking about the new home and experiences. But, when a youngster spends long periods of time chatting with friends "back home," it can decrease the motivation to become involved with the new community and interfere with the adjustment to new friends. 23. Timing the move is important. Moms and dads should carefully consider their options. Certain moves may be inevitable (e.g., when a parent loses a job, when finances are strained, etc.) or impossible to predict (e.g., when a parent dies). But when circumstances allow for flexibility, it is often better to postpone or avoid a move at certain transitional times (e.g., when the Aspergers adolescent is a junior in high school, immediately following a divorce, etc.). When timing is not ideal, options may be possible to ease the strain (e.g., having a high school student remain in town with a friend or relative to finish out the year). 24. When moms and dads are sensitive to the impact of moving on their Aspergers youngster, they can make moving a positive experience, enhancing the Aspie’s emotional growth, adaptability, self-confidence and social skills. You do not need to get rid of your favorite things. Why you leave your favorite things, if you can take them all with you when you moving to enother place! In your case, to keep all the old things of children is better solution, they will feel part of the old place on the new one. It is the best for moove https://www.moveprola.com/woodland-hills-movers/ service. Planing your move in advance will be convenient for you. And do not worry about the children and their communication, it will in itself be adjusted. Do not forget that they can be smarter and more resourceful than we think.